So much has happened over the last few months and thanks to my newly-funded collaborators, research into QI is now running on three cylinders instead of one: it was just theory, now the work includes models and experiments as well. My post doc, Dr Jesus Lucio is working very well. I asked him to write a matlab script that simulates wide binaries with ordinary Newtonian physics, and MoND and QI. His script has produced a very nice animation (see below) that shows that when you model a real wide binary, only quantised inertia (red) predicts the stars to be bound together (as they are in reality). Newton and MoND (blue and green) predict wrongly that the two stars should zoom off to infinity, and so they are falsified. He has extended this tool to also simulate the Solar system. It compares the predictions with the observed orbital trajectories. We are having fun simulating Oumuamua at the moment. The other project I asked him to do is to develop a numerical COMSOL simulation of the asymmetric Casimir effect that underpins quantised inertia (reference 1). The process by which when you accelerate something to the right, say, relativity and the speed of light limit, implies there is a region of space to your left that you can no longer see and a horizon forms that damps the intensified (Unruh) quantum vacuum on the left side of the object leading to a net quantum force that resists the object's acceleration: inertia. Unfortunately COMSOL is having a hard time modelling a particle at the tiny Planck scale (10^-35 metres wide) moving within a cosmos approximately 8.8x10^26 metres wide. So, our first crude plan is to use a particle the size of a galaxy cluster, and then slightly smaller, and we will use the difference to extrapolate down to the Planck scale. The two experimental teams I employed as part of my funded project are also getting started building light-emdrives. The Dresden team are building resonators, but the Madrid team are already experimenting and have seen some thrust of the hoped-for kind, that is over six sigma outside the noise. However, it will be a long struggle to show it is definitely The Big One. They are now slowly eliminating mundane effects that could also be causing it. As well as thinking about thrust, I am trying to generalise and further extend QI to explain gravity. After reading a book by A. Unzicker (ref 2), it seems that Einstein may have been on a more QI-compatible course until 1911 when he was redirected into bent space by his geometer friend Marcel Grossman. The variable speed of light version of general relativity (VSL-GR) that Einstein published in 1911 had a flaw at the time, but that flaw was corrected by Dicke (1957) (ref 3) and this version is far simpler and agrees with all the predictions of standard general relativity. This VSL-GR is far more satisfactory to me than normal GR since it relies on a process (slowing photons) that can be measured directly, as opposed to standard GR which relies in bent space, which is an abstract thing that you cannot measure directly, except by virtue of the moving objects it was designed to predict anyway. I have had some success in building a mathematical bridge between quantised inertia and VSL-GR. I am still trying to decide whether the piles I built the bridge on (the assumptions) are solid or not. The best way to do this is to jump up and down on them a lot. I'll let you know if there is a splash. Dicke, R., 1957. Gravitation without a principle of equivalence. Review of Modern Physics, 29, 363-376. The best way to do incisive science is to find an empirical case that can discriminate between hypotheses, in this case dark matter, MoND and QI. Galaxy rotation is not ideal in that respect. To recap: galaxies spin far too fast at their edges to be stable. They should fly apart, but they appear to be gravitationally bound. So astro-physicists have proposed that there is invisible dark matter in them to hold them together. One of the properties of this dark matter has to be that it stays spread out, otherwise it would collapse to the centre of the galaxy and not predict the rotation correctly. The problem is that although QI can predict galaxy rotation, dark matter can be 'fudged' to predict it too, and even MoND is tweakable (a0). Something un-fudge-able is needed and wide binaries are brilliant examples of unfudgeability. I have discussed them before. They are binary stars so far apart that their accelerations are as low as they are at the edges of galaxies. Hernandez et al. (2018) have shown in some brilliant papers, that wide binaries orbit each other far too fast, just as galaxies do. The data I have used here is from his latest paper which uses brand-new GAIA data. The data is shown by the crosses in the Figure below (prepared by my new post-doc Jesus Lucio). The x axis shows the separation of the stars in parsecs and the y axis shows their mutual speed in km/s. The grey area shows the uncertainty in the data, so it means that the orbital speed at each separation is somewhere in the grey area. The dotted line shows the prediction of Newton or of general relativity (the same in this case). Just as in galaxies, although Newton/GR says the orbital speed should decrease with radius/separation (dotted line), the observed speeds stay much higher. Beyond a distance of 0.2 parsecs both Newton and general relativity are falsified. These theories disagree with the data and dark matter cannot be added to these wide binaries to save them, because to fit the larger galaxy it must stay diffuse. Unless they now come up with quantum dark matter that can be simultaneously spread out and clumpy! The prediction of MoND is shown by the dashed line here with its fitting parameter set to a0 = 1.3x10^-10 m/s^2. It under-predicts the data at 1 parsec but if we set a0 = 2x10^-10 m/s^2 then it just about fits. However, the MoND prediction should probably be closer to the Newtonian/GR curve because it is subject to the External Field Effect (still under debate) which means that external accelerations bring it back towards Newtonian behaviour. These wide binaries are close to the Sun, and so accelerations due to the galaxy are still on the order of 8x10^-10 m/s^2. So, MoND is possibly also falsified by this data. The prediction of quantised inertia is shown by the solid line, with the error shown by the two lighter solid lines above and below it. QI agrees with all the data (just). I submitted a paper on this to MNRAS a few weeks ago including a plot similar to this one, but in which QI did not quite agree. Well, a sincere thanks to my post-doc who recently spotted a factor of two error in my calculations which was making QI seem worse than it is, and he corrected it. So we will now resubmit with the new result. In summary, QI predicts the orbits of these 83 pairs of wide binary stars better than other theories. Furthermore, QI does it without the need for any arbitrary fitting parameters (MoND needs one). QI needs just the observed mass, the observed speed of light and the observed cosmic scale. QI can only predict one outcome, and that turns out to agree with the data. McCulloch, M.E. and J.H. Lucio, 2019. Testing quantised inertia on wide binaries. Submitted to MNRAS. It has been a time of transition for me. Last year I was a part time lecturer. Now I am a full time research lecturer with no teaching duties, a post-doc and a hyper-ambitious project to manage. Projects don't come more ambitious than propellant-less propulsion. Anyway, I'm trying to seize the chance of a lifetime with both hands. With my new funding, I have employed a post-doc in quantised inertia (QI). He started on January the 4th). He has already produced several toy models of basic QI-thrusters, treating QI mathematically as an external force which simplifies some things, and has just written a fascinating report on that, which may become a paper. I have also managed to get all parties, Plymouth University, TU-Dresden and Alcala, Madrid to agree to and sign the contract agreements - a new experience for me. Last week I visited Airbus & told them how QI could be useful for satellite station-keeping since it predicts thrust without the need for propellant: the kind of thrust that does not run out. You just need energy for Solar sails, assuming it works. I'm now very confident about QI in the astrophysical arena (paper). The difficulty will be making it appear in a lab, but lab tests are still the most direct test and all roads in physics lead to the lab. My talk at Airbus was very popular - people were crowded into the lecture room - I suppose that is not surprising when you suggest to people in an aerospace company that they can ditch fuel! Next month I will be meeting the great Roger Shawyer, and that will be fascinating. It could be that some polite disagreements will occur because we have different interpretations of what may or may not be going on in those hot copper cones. I'll be asking him about the recent null tests of the emdrive and trying to dig down a little to his comments that the emdrive needs a little resistance to push against. Who doesn't? It would also be great to meet Hawking (but sadly too late! ), Milgrom, John Anderson, Paul Davies, Bill Unruh & Hal Puthoff (I have met the latter by email). 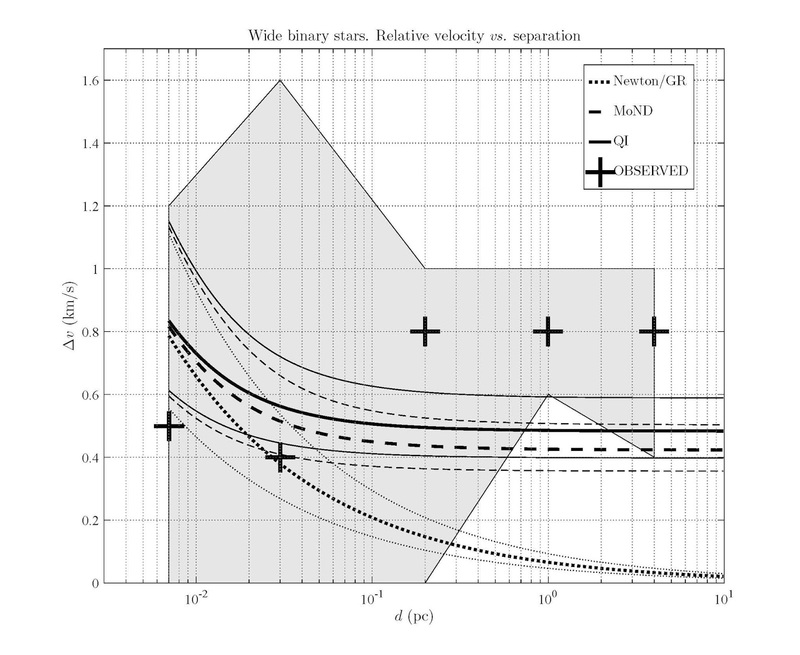 I have submitted a paper to MNRAS showing that quantised inertia predicts wide binary orbits well. 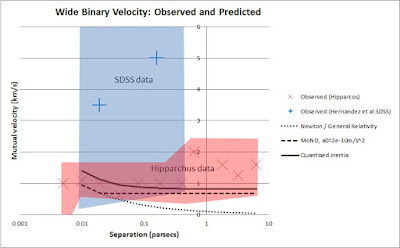 To summarise: co-orbiting binary stars far apart show the same sort of anomaly that galaxies do at their edges (too high an orbital speed), but in the binaries' case you cannot add dark matter, because it must stay spread out smoothly if you want to continue to predict the whole galaxy. They can't have it both ways! 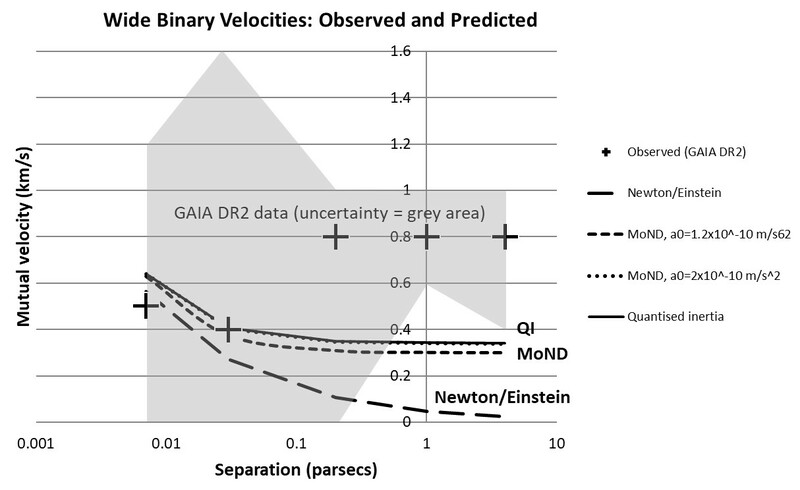 I've now shown that quantised inertia predicts wide binaries' orbital speeds (orbital speed data from Hernandez et al, 2018) just as well as MoND, and without needing MoND's adjustable parameter or, of course, dark matter, see the plot. 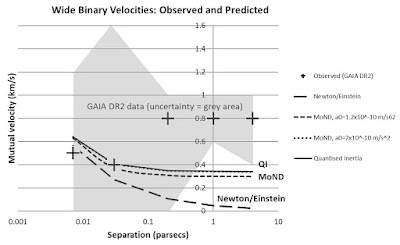 There is a discrepancy around one parsec separation where both MoND and QI underpredict the data. I've submitted a paper to EPL on the Allais effect, and although I realise this is controversial data, it is true that any observation that disagrees with the standard model is going to be controversial, and yet the only observations that will help us build a new physics will have to disagree with the standard model, and so they will be controversial. In other words, the quickest way to build new physics is to look for trouble. I would not say that is how I work, but it may appear that way to some! The Allais effect is also less than ideal since it has not been seen in some experiments, which bothers me, but I enjoyed writing the paper since it involves QI working elegantly in quite a different situation. I've submitted a paper with Jaume Gine improving the way I derived quantised inertia before from the uncertainty principle, so we can now derive QI exactly that way. He is also helping me to resubmit the paper on EPR and time that I've been trying to get published for years. We are just ironing out our differences now and then Foundation of Physics might be the lucky target. I've also started a paper that was inspired by my son. I'd just been fiddling around with QI formulae while I was waiting for him to finished a school tutorial, and as I was driving him home he asked me a question about schoolwork "Dad. What's Pi?". I said "3.14.." and immediately realised that the odd number that dropped out of QI onto paper half an hour ago was close (within 0.5%) to Pi. In haste I hadn't made the connection. This result may be a coincidence or it may have given me a huge new handle on nature. It rings true to me, and is very simple. I'll spill the beans when I'm sure it's not a circular argument.. The Journal of Space Exploration has just accepted my latest paper in which I focus far more on applying quantised inertia to propulsion, and which also shows an even simpler way to derive and understand QI, just from the uncertainty principle and relativity. This is a path I've been tending towards for a long time (see references). Werner Heisenberg showed, for a quantum object, the uncertainty in its momentum (dp) times the uncertainty in its position (dx) always has to be larger then Planck's constant divided by two Pi (hbar), over two (aka hbar/2). So: dpdx > hbar/2. The assumption of quantised inertia is that you can apply quantum mechanics on the macroscale, if you take account of relativistic horizons. So, imagine we have a highly-accelerated system that excites the quantum vacuum (another way to say that is to say it sees Unruh radiation). For example, this might be a cavity with microwaves or a discharge spark inside. Imagine we now increase 'hbar' to represent the energy in this macroscopic system - bringing quantum mechanics to the macroscale. Now make the cavity asymmetrical so that the Unruh waves on the left side are blocked by a shield but those on the right side are not. Since you are blocking information from the left from getting to the system you are decreasing dx on the left side (the uncertainty in position in space is decreased because so far as the system knows there is no space beyond your shield), and so dp must increase to the left. This means that the normal quantum jitter (dp) usually very weak, is now magnified by the large accelerations (Unruh radiation) and also must be larger towards the left hand side. The system on a statistical average will move towards the left. As I show in the new paper, this predicts, to the right order of magnitude, the thrusts seen in the emdrive, the Woodward drive and also some intriguing results from asymmetrical capacitors. The thrust of the argument :) is that quantum mechanics may not just apply to the small, and relativity to the fast: quantised inertia implies that at very high accelerations they join up to produce observable, and very useful, behaviour. Thrust without propellant means much lighter (cheaper) launch systems, and the possibility of interstellar travel in a human lifetime. As I have repeated many times on this blog, galaxies spin far too fast to be bound by their visible matter. This anomaly disagrees with standard physics and yet it has not only been brushed under the carpet, but it has been forbidden in many places to even admit that there is a carpet. A serious flaw (floor) in the mainstream attitude :) The carpet is the dark matter that has been invented to cover this up and save general relativity (which may be fine for high acceleration, but does not work for low). There are two cases though, in which the dark matter fudge cannot be applied 1) globular clusters (see Scarpa et al., 2008 below) and 2) wide binaries which are even better (discussed earlier here). Wide binaries are twin star systems that orbit with a separation of more than 7000 AU and they show the same impossibly fast orbits that larger galaxies do. Dark matter cannot be used to fudge them because in order for dark matter to predict galaxy rotation it must stay spread out and therefore it cannot be squeezed into little wide binary systems. So wide binaries are the astrophysics equivalent of testing the emdrive in a vacuum which rules out air currents - wide binaries rule out dark matter. I have started looking a wide binaries again, going back to a paper of Hernandez et al. (2014) who processed a lot of data on them. The data is shown in the Figure by the blue and red crosses. The x axis shows the separation of each pair in parsecs and the y axis is their orbital speed (km/s). I've shown the uncertainty in the data crudely by the blue and red coloured areas around the crosses, so you can see that the SDSS data (blue) is far less accurate then the Hipparcos data (red). To be deemed successful a theory has to predict within the blue and red areas. I have added to the plot the predictions of general relativity (the dotted curve) which lies outside the coloured areas for all separations greater than about 0.03 parsecs. Therefore, because dark matter cannot be applied in these cases (unless they add more bells and whistles to it) we can say that general relativity has been falsified. This is a strong indication that it is wrong in galaxies as well, since the anomalies are very similar. The other curves show Modified Newtonian dynamics (MoND, the dashed curve) and quantised inertia (the solid curve). Both theories predict the data, but MoND has been tuned to work by arbitrary adjustment of its free parameter. 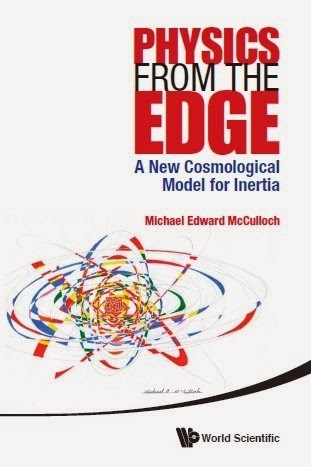 Quantised inertia predicts the data all by itself, without any tuning, an advantage which shows it is deeper, more predictive (it can predict the change in the systems' rotation with cosmic time too) and also simpler. Occam's razor cannot be repealed. Note that the acceleration used for QI here includes that due to their mutual spin and their movement around the galaxy. The next steps are to submit this to MNRAS, and try to shrink the blue and red areas of uncertainty in the data using the new GAIA dataset. 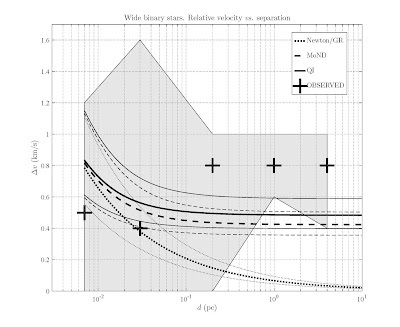 This is an elegant way to debunk general relativity at these low accelerations, dark matter too, and demonstrate the advantages of QI - better data is needed though. GAIA dataset: http://cdn.gea.esac.esa.int/Gaia/ (Thanks to F.Zagami for the link).